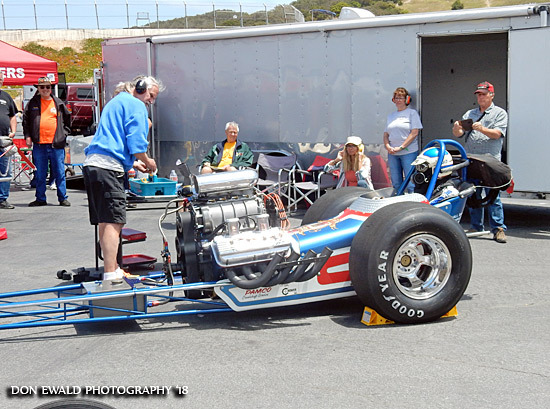 05.23.18: The 2nd Annual Nitro Revival was dedicated to Ron Johnson who would have been very proud of the results. 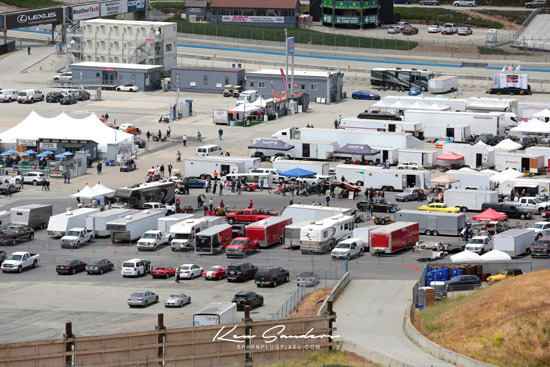 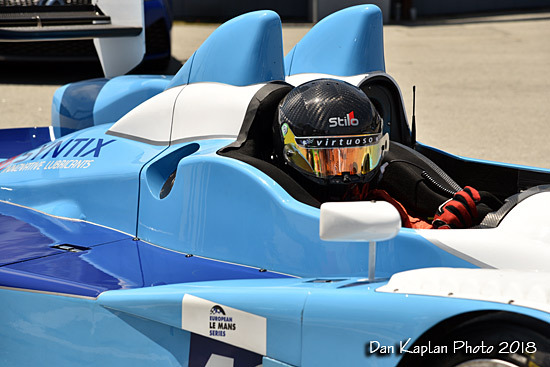 Although much different than the inaugural event in Barona, the new format worked incredibly well at Laguna Seca. 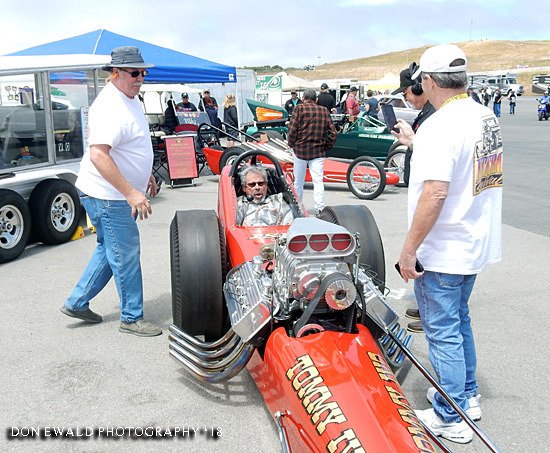 Also the event staff here was much smaller than Barona and included Race Director Steve, Cindy Gibbs, Randy Gregg, Alan "Mole" Miller, Don Ewald, Debby Gibbs, Stephanie Gibbs Kinder and Gene Gastelum with Harley (race control). 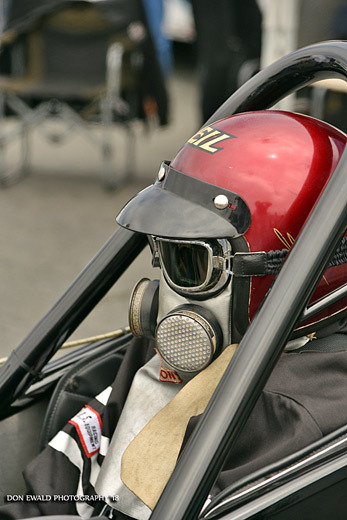 Like the first Nitro Revival this was more social than competitive. 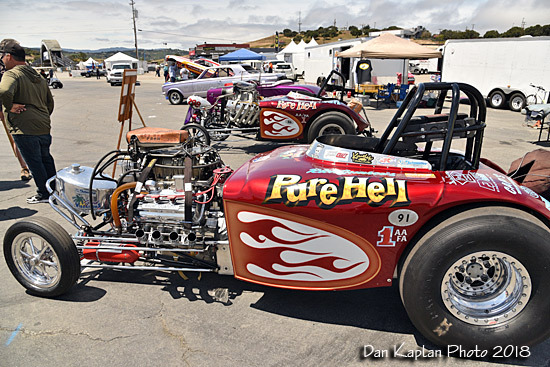 We attracted more than 30 premium Cackle Cars from as far away as Minnesota and Canada, most with period-correct push vehicles from the 1950s and 1960s. 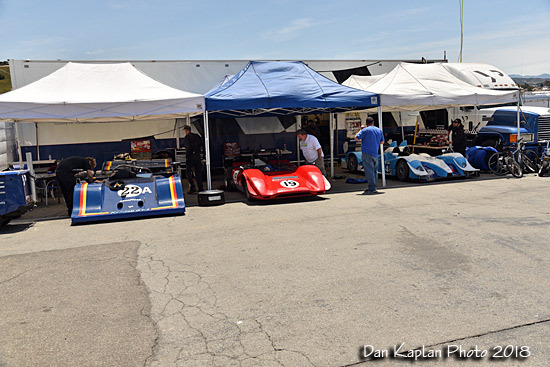 Cacklecars started rolling in on Thursday and all were very pleased with the prime area allotted to our program. 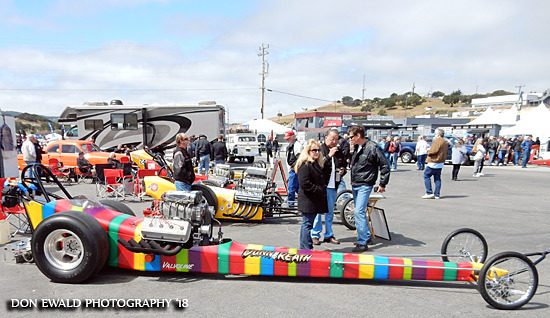 We got a huge chunk of the paddock for the cars and a large area a short distance away for the Ace's Hot Rod Hangout and the huge Welcome Center tent supplied by the Jim McLennan Foundation & Champion Speed Shop. 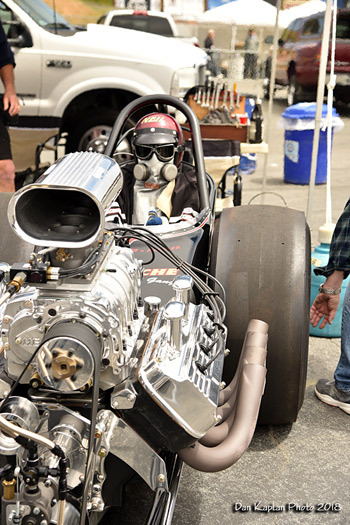 Friday was filled with bench racing and static fire-ups. 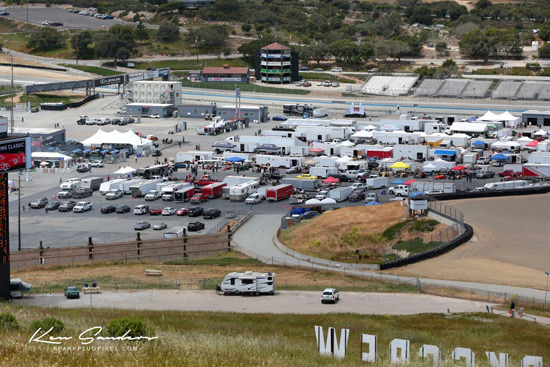 There was a lot of fan traffic including many of the road course drivers who were in awe of the other world. 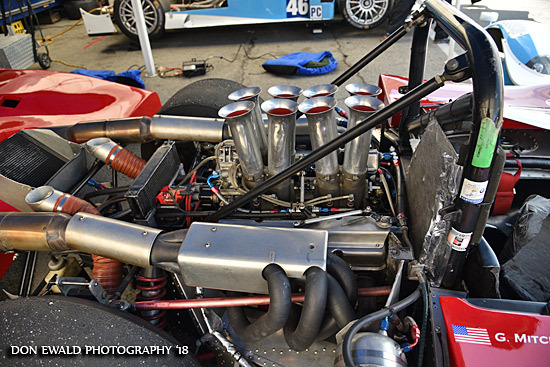 You guys were crazy was overheard more than once. 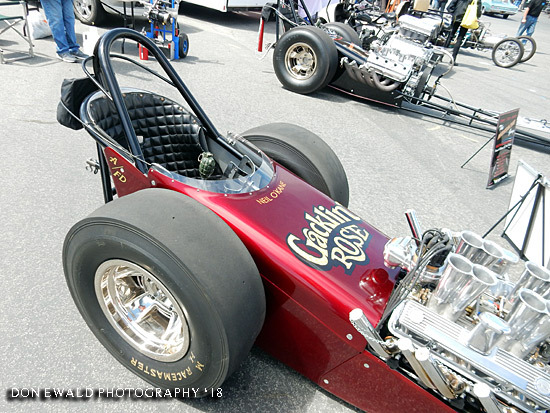 On Saturday Nitro Revival took center stage with the high points of the day being the push starts of pit row and the awesome Line of Fire in the paddock. 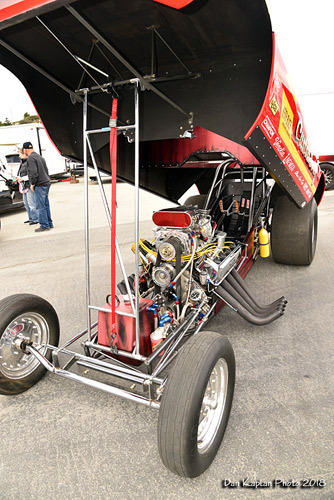 Total nitro overload. 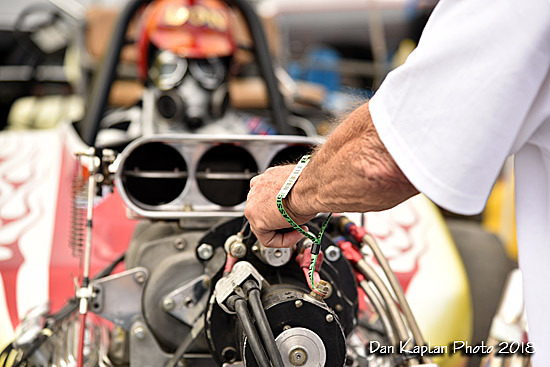 The fans went nuts as you will see in the photos included in this coverage. 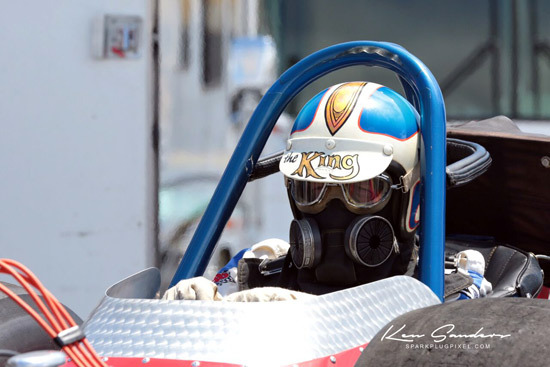 How about a big shout out to all of the International Drag Racing Hall of Fame Members and NHRA Champions who joined us: Don Garlits, Ed McCulloch, Kelly Brown, Mike Dunn, Shirley Shahan Bridges, Tom Hoover, Ed "Isky" Iskenderian, Rob Bruins, Jim Brissette, Jim Fox, Steve Gibbs, Marvin "Who" Graham, Red Greth, Harry Hibler, Dennis Holding, Tom Jobe, Delli Reath, Bob Muravez, "Wild Bill" Shrewsberry, Joe Schubeck, Walt Stevens, Richard Tharp, Herm Petersen, Jerry "The King" Ruth, Frank "The Beard" Bradley, Don Hampton, John Peters, Rich Guasco, Dave Uyehara, Ken Logan, Kenny Youngblood, Bob Brandt, Don Berry and Dwight Huges. 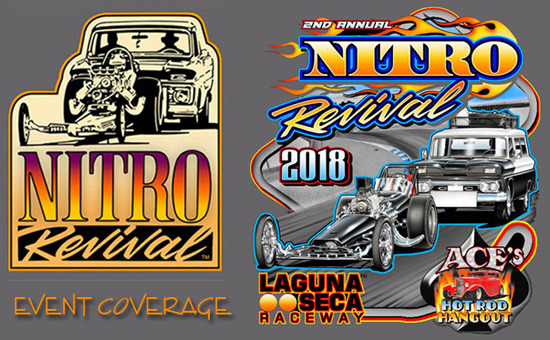 Those of us at Nitro Revival give a Special thanks to Laguna Seca's Brad Littlefield who is the Public Relations Manager, Melvyn Record who is SVP Marketing, Kathleen Tran the Event Operations Coordinator and Gill Campbell who worked tirelessly to make this happen at their venue. 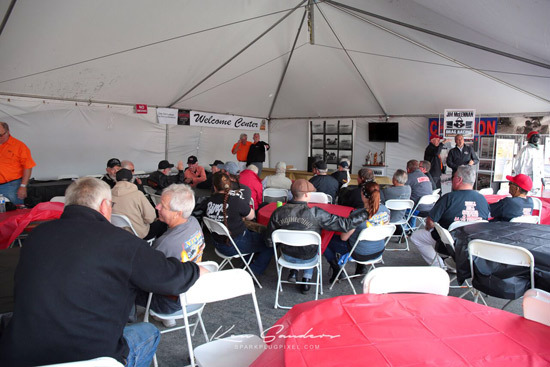 The staff was great, the food was delicious, we were treated like special guests instead of just a bunch of old racers. 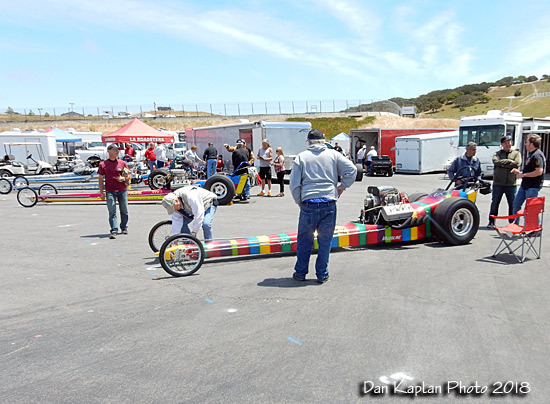 Kudos to all the folks of Laguna Seca. 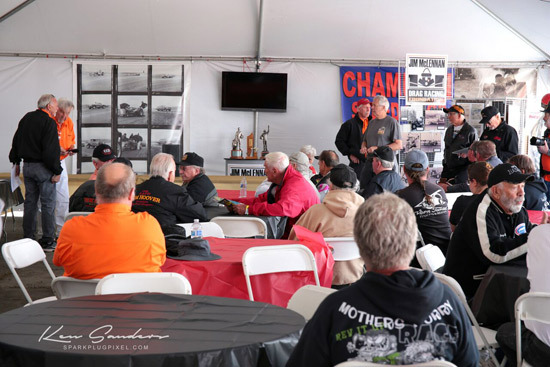 In summary, we were humbled by the attendance of so many of the sport's stars and we are enthusiastically looking forward to our 3rd event that will likely return to Laguna Seca in 2019. 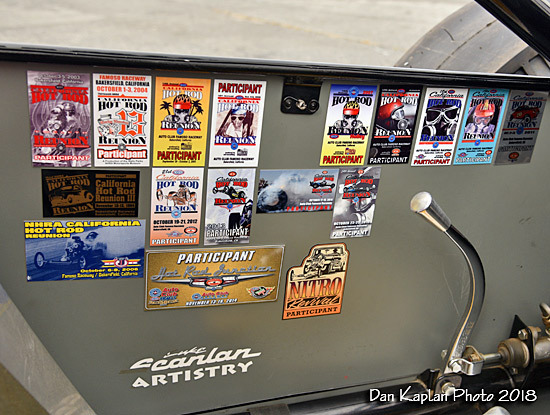 We hope this extensive coverage delivers the flavor and excitement of the weekend. 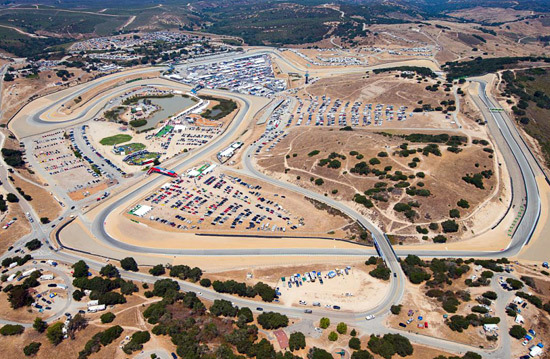 Further, we hope it will entice you to put the 2019 Laguna Seca Spring Classic on your must do calendar, as we will be back! 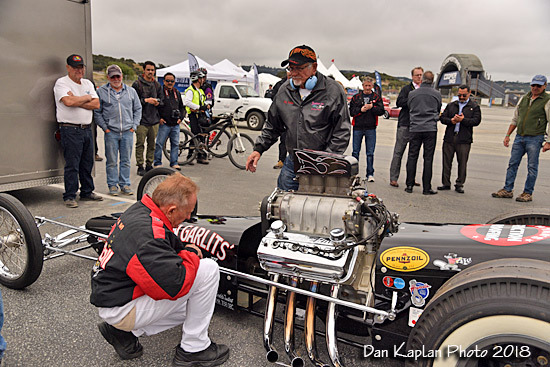 Over 30 members of the International Drag Racing Hall of Fame including Big Daddy Don Garlits signed autographs and mingled with fans while restored Top Fuel dragsters, Funny Cars, altereds, and more cackled their engines in the paddock. 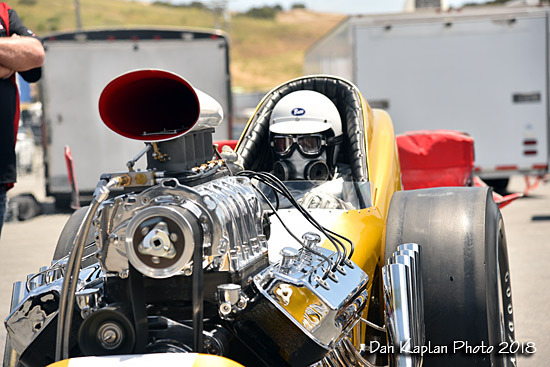 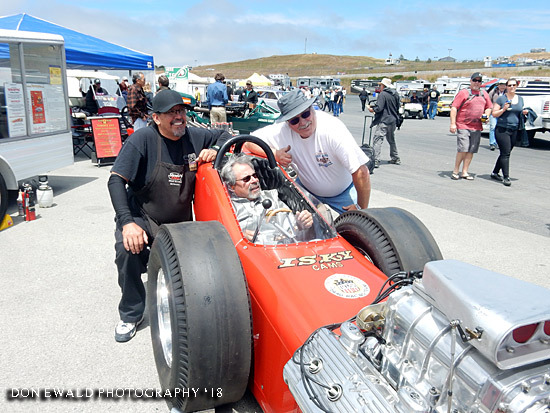 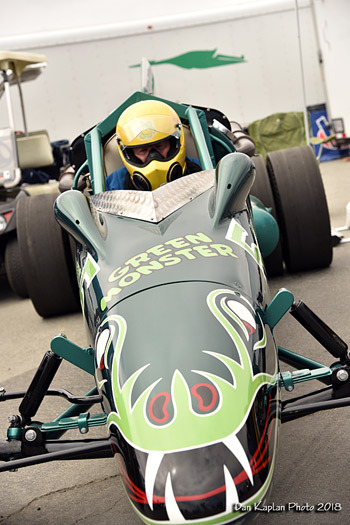 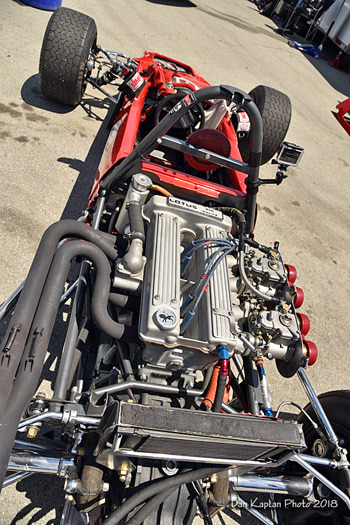 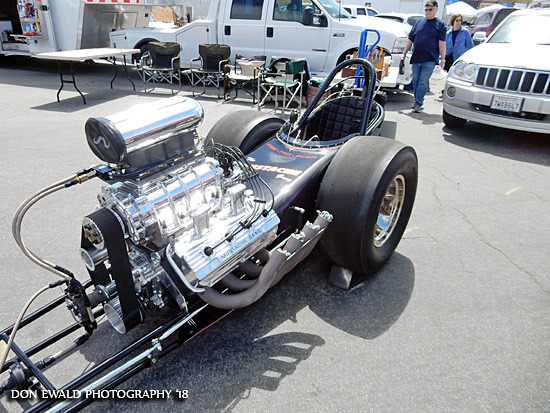 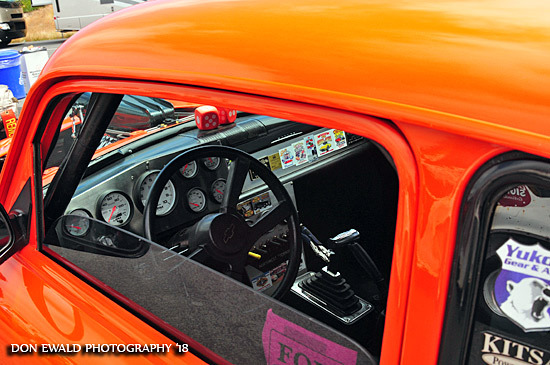 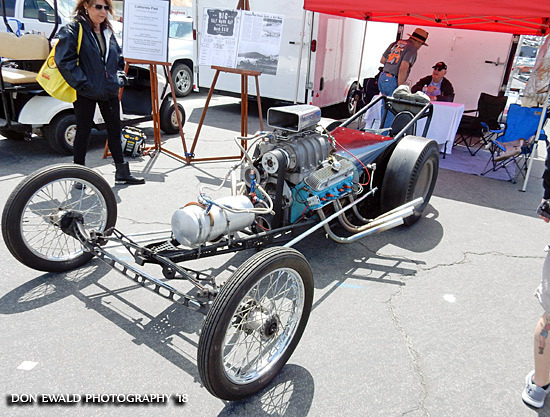 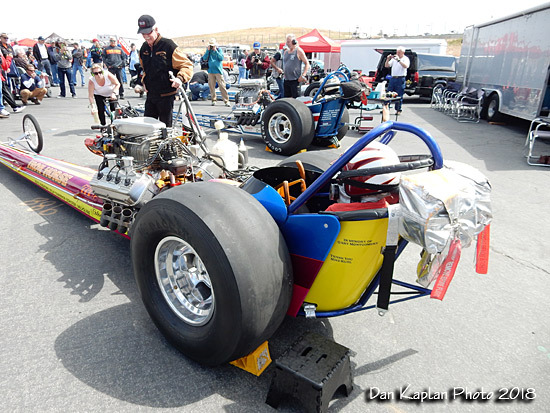 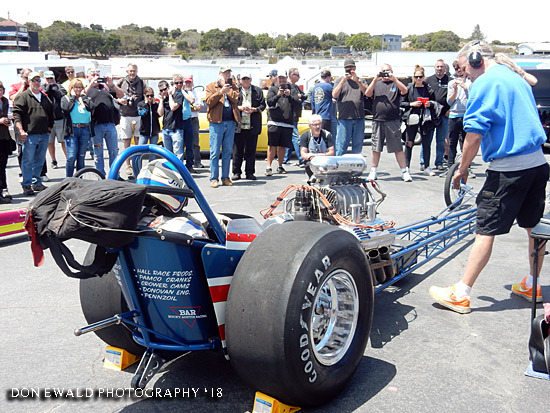 A highlight was push-start demonstrations on Saturday afternoon that brought legendary dragsters to life on an iconic race track not known for hosting machines designed to accelerate down the quarter-mile. 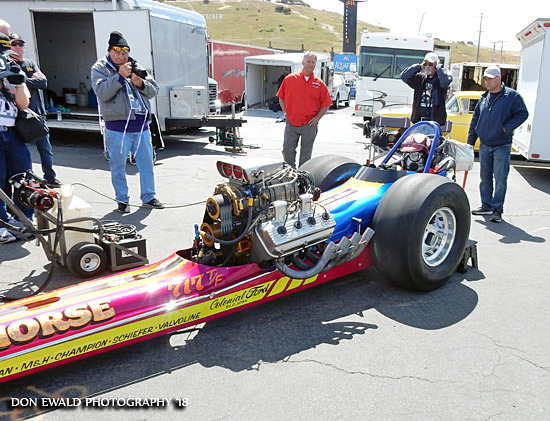 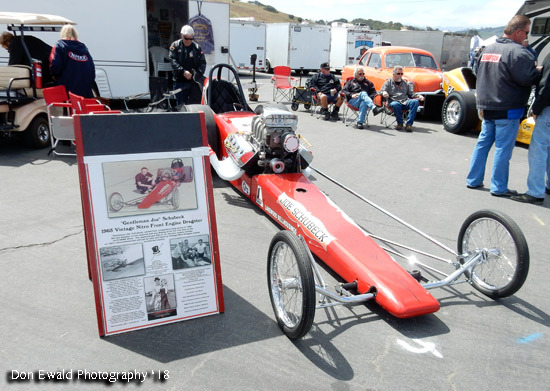 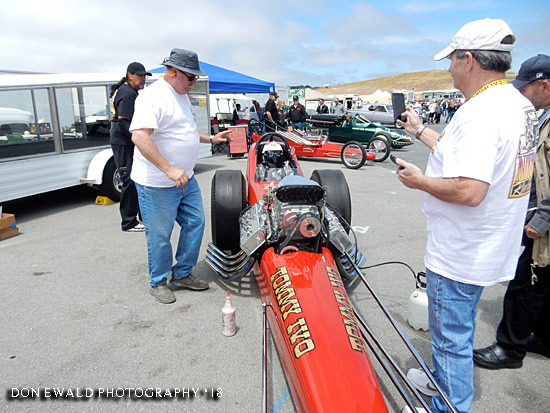 Three dozen dragsters closed Saturday activities in a great spectacle by firing all in sequence during the Line of Fire that rumbled through the "Monterey Peninsula hillside". 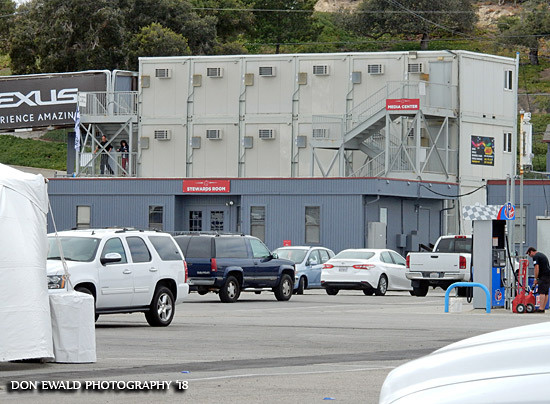 Entering this massive racing complex on Thursday was eye opening. 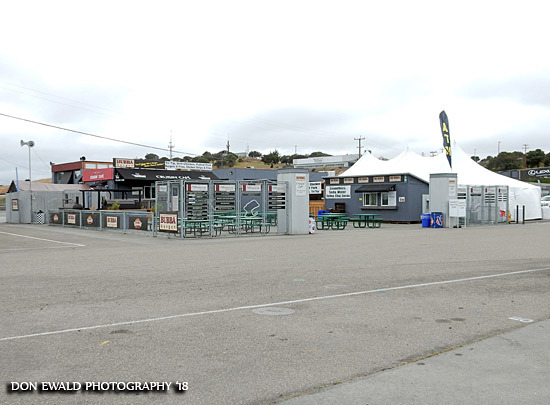 This is the view of the food court and Ace's Hot Rod Hangout (big tent) from the entrance of the cacklecar arena of the paddock. 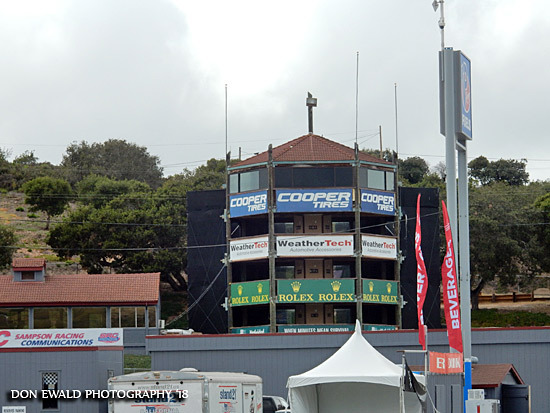 Media building behind the Steward Room. 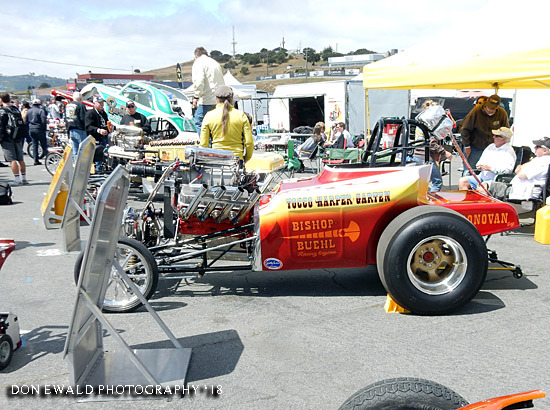 One of the first cars on the property was the Swamp Rat III-B owned by Sonny Messner. 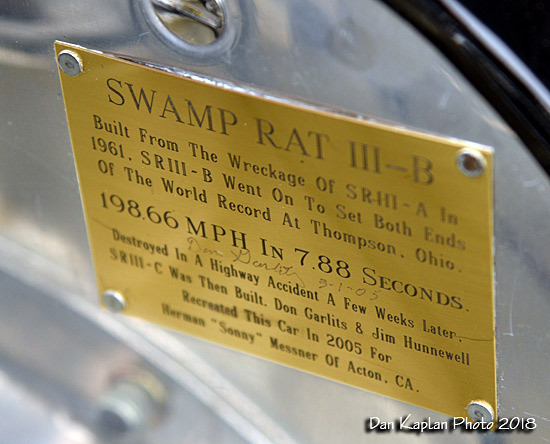 The SR III-B car was built from the wreckage of the original Swamp Rat III. 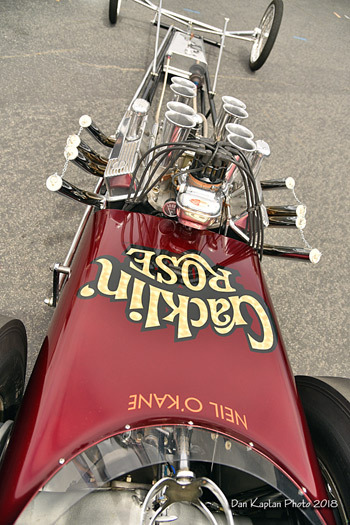 This B car re-creaton was done in 2005 by Don himself so there is a lot of attention to original details. 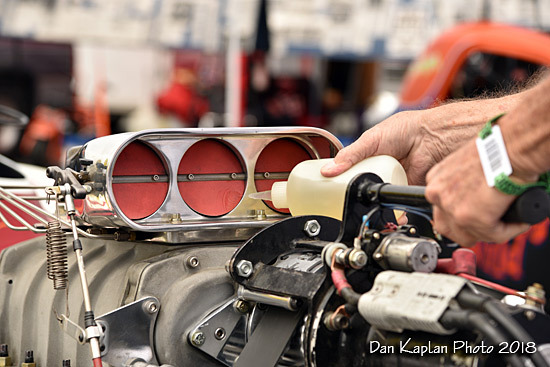 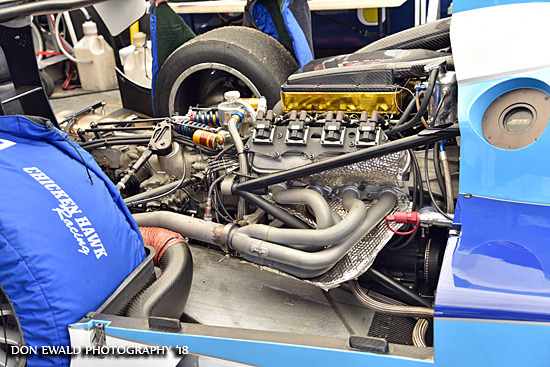 For example, a salvaged component would be the fuel pump driven off the back of the blower. 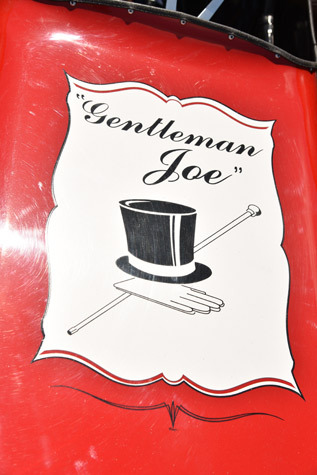 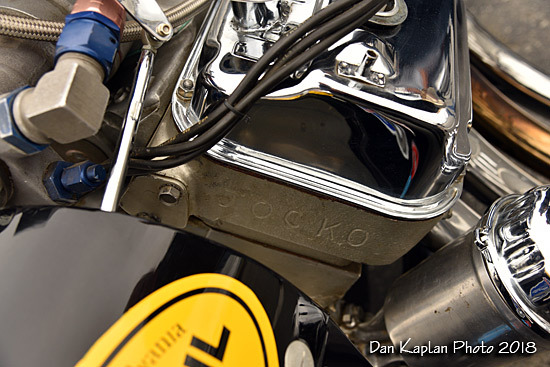 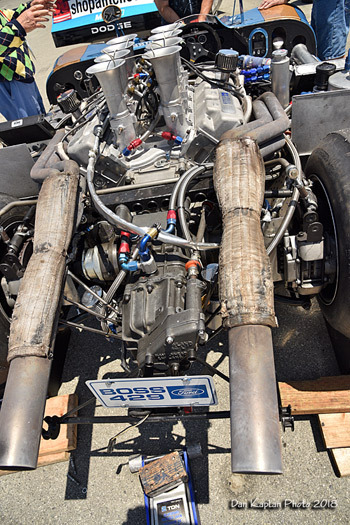 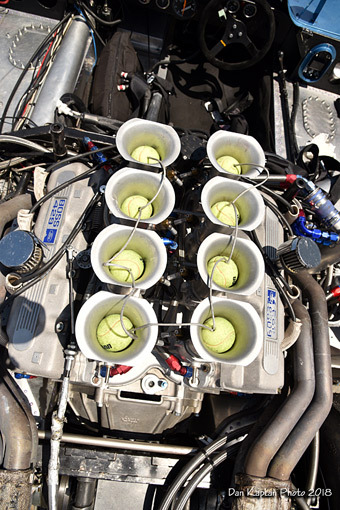 The engine was built by Garlits to the exact specs and parts as the original including a very rare set of JOCKO heads. 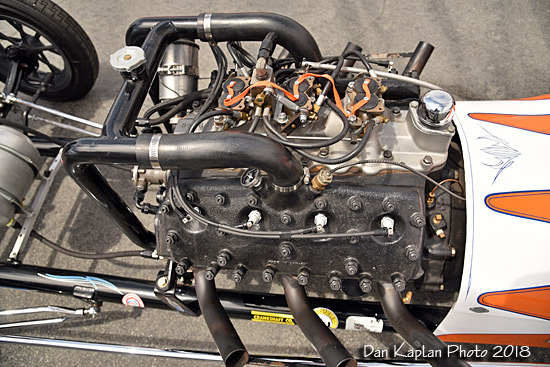 Stock stroke, high compression, low blower boost and lots of nitro. 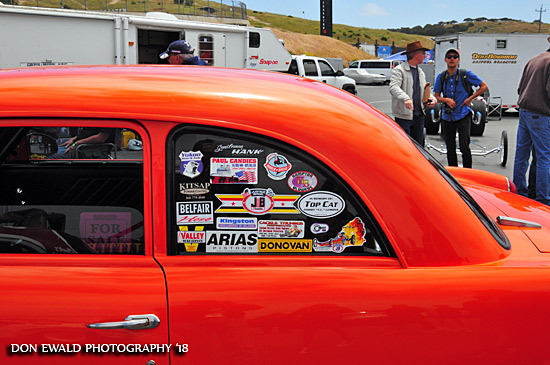 Sonny had added his touches with event stickers that the car has appeared in. 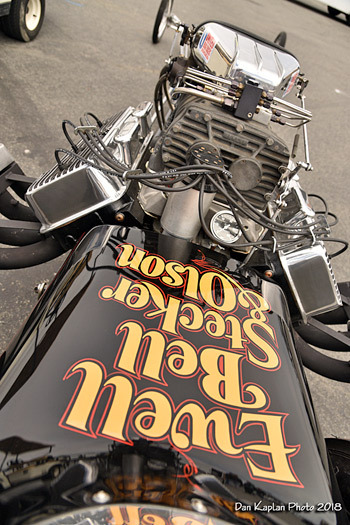 Friday was a kicked back, do what you want day. 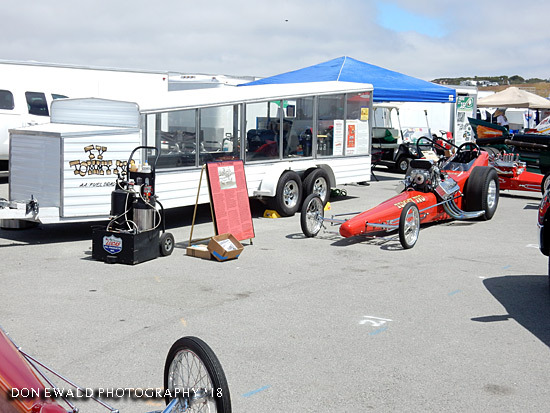 Set up, visit, burn nitro, renew friendships, wander the pits, kiss babies or well, you get the picture. 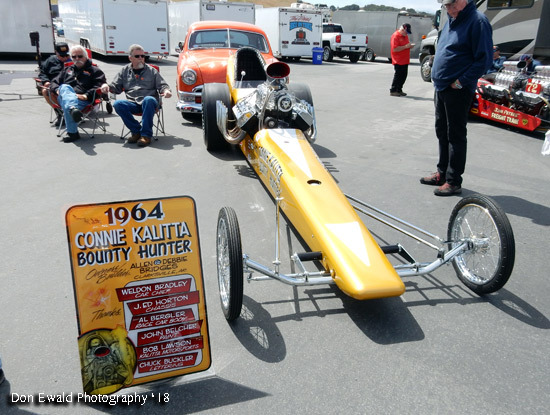 It would be cut short for many due to the Cannery Row event that evening. 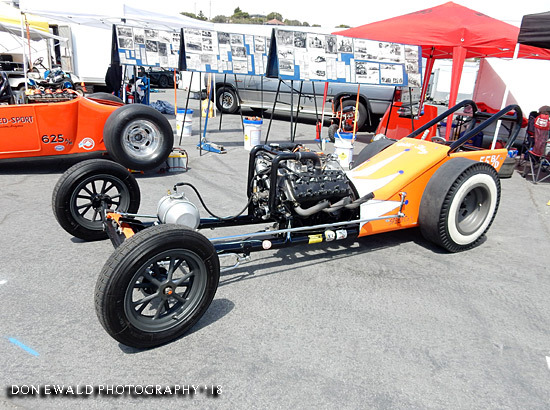 Roger Riggsby's "California Past" Pontiac powered faithfully represented the mid 50's gas dragsters. 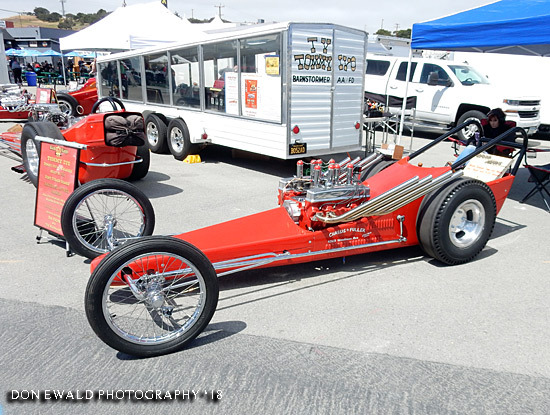 If you were into drag racing in 1959 you know this car. 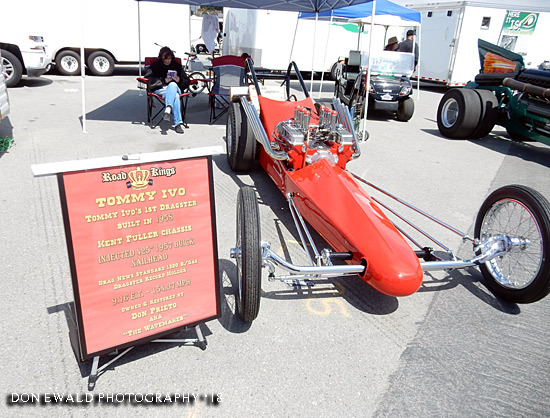 Don Prieto recreated the car that got TV Tommy Ivo on the map. 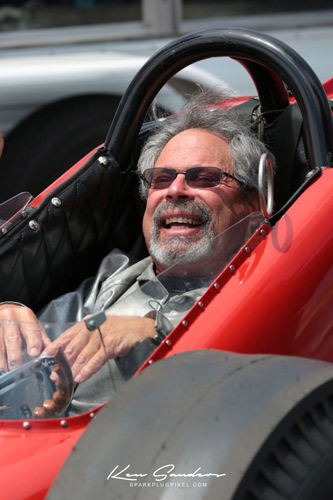 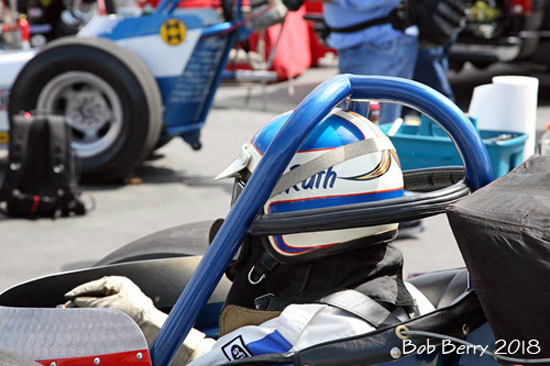 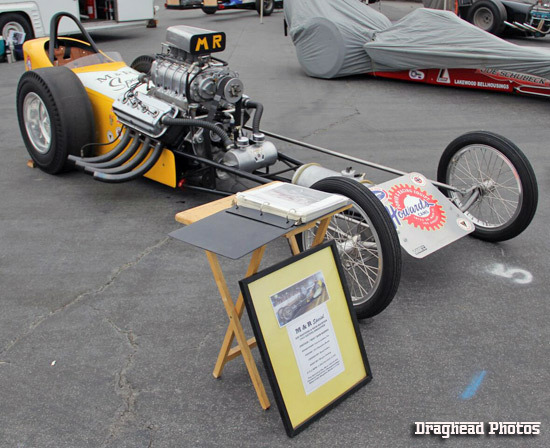 His injected Buick dragster was just a preview to come from one of the sport's enduring racers. 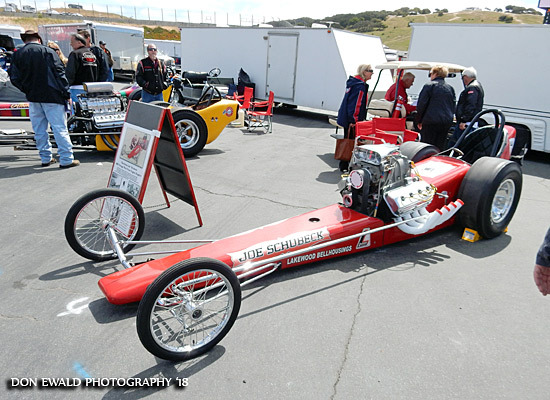 Joe Schubeck and GiGi were on hand with his 1965 fueler. 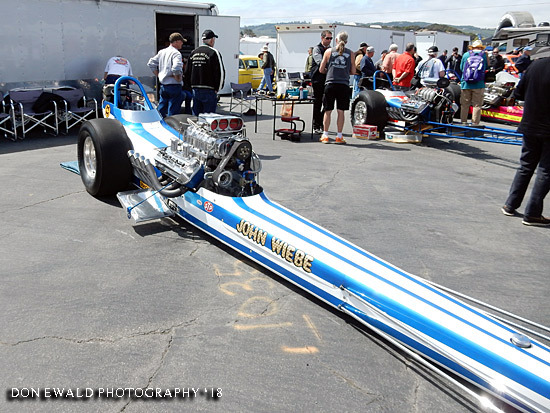 Roger Lee brought his Masters & Richter re-creaton to the dance. 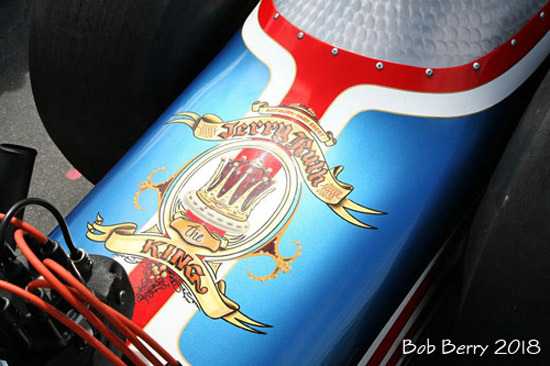 Jerry "The King" Ruth was the first to burn money and that got the fans into the loud car area. 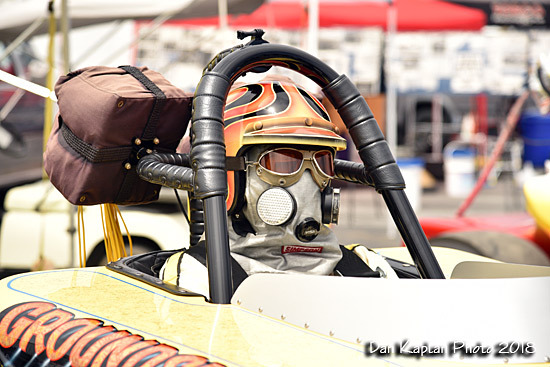 Also anxious to burn the good stuff was the Connie Kalitta "Bounty Hunter" of Allen Bridges. 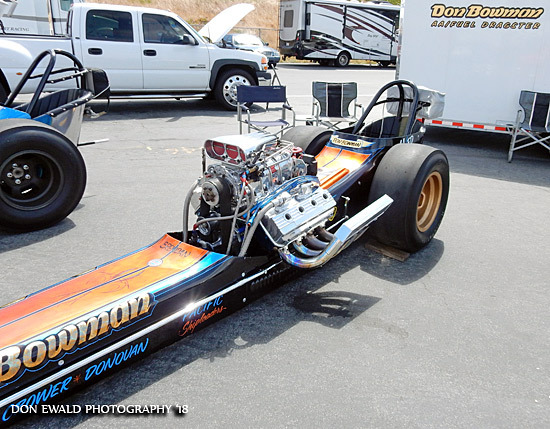 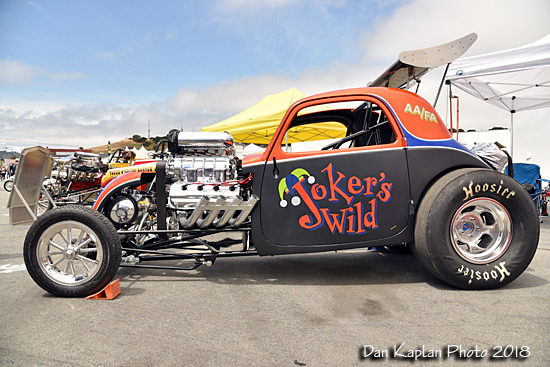 Nitro Revival photog Dan Kaplan was at the right place at the right time to add the Tommy Ivo Barnstormer to his fire-up list. 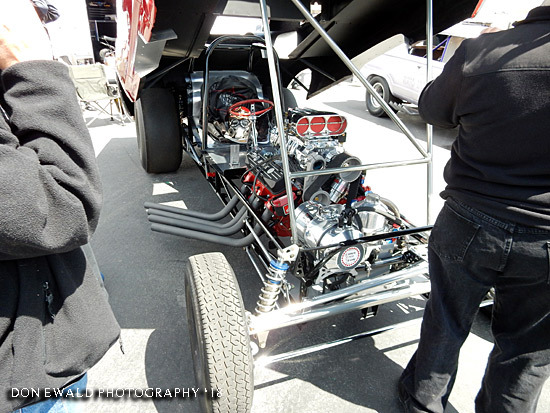 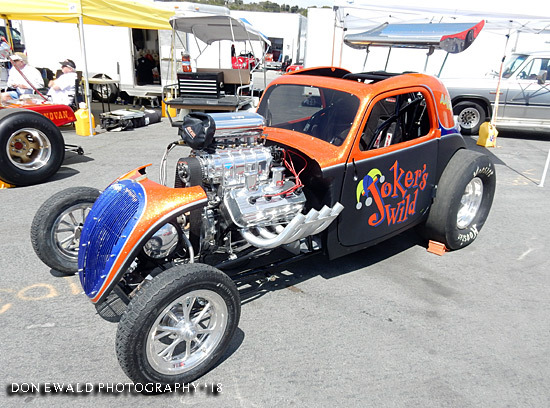 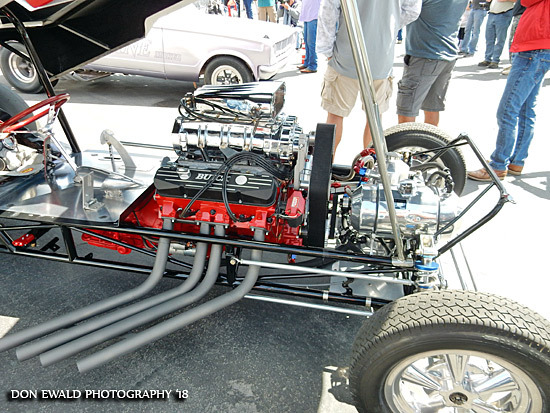 Herm Petersen unloaded his badass 392 blown one-off '32 Willis push car. 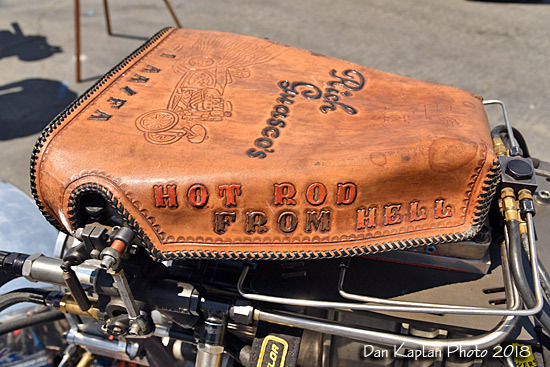 If you want a real one off hot rod, this guy is for sale. 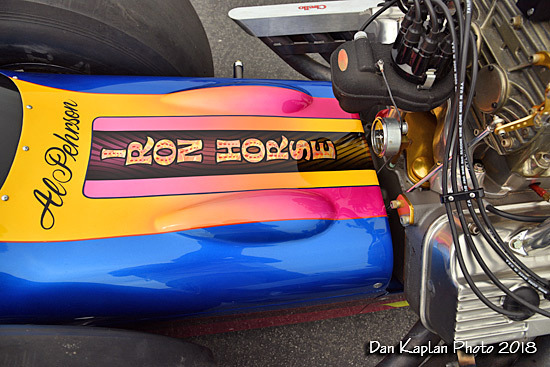 Sam Chastain's "Iron Horse" is always a fan favorite. 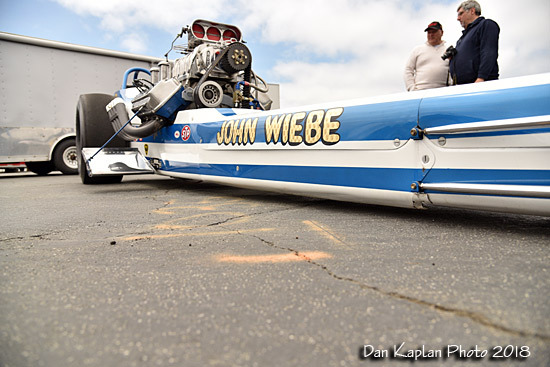 Don Love brought the John Wiebe "Violin Car" down from Washington. 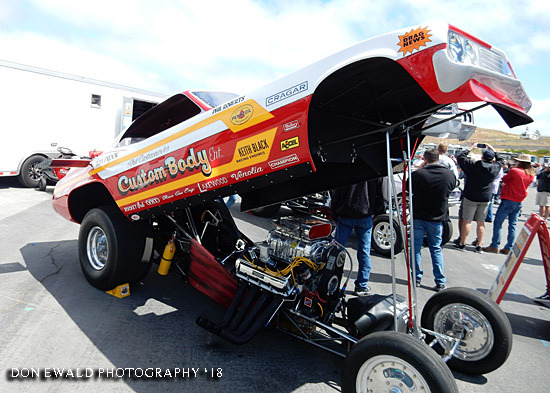 Glenn Way got the AA/FA contingency into the act with his Groundshaker JR.
Ross Howard has been a supporter of Nitro Revival from day one, literally. 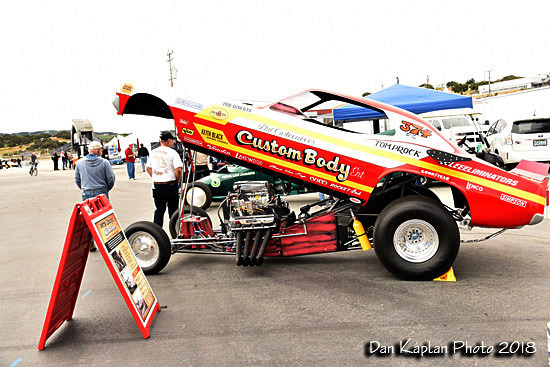 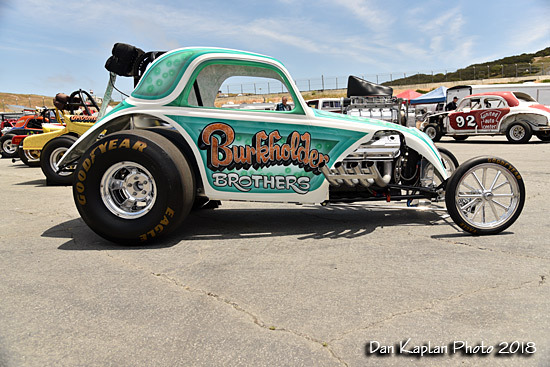 He was the first racer to commit to the Barona event and his Custom Body Enterprises AA/FC is for sure a fan favorite. 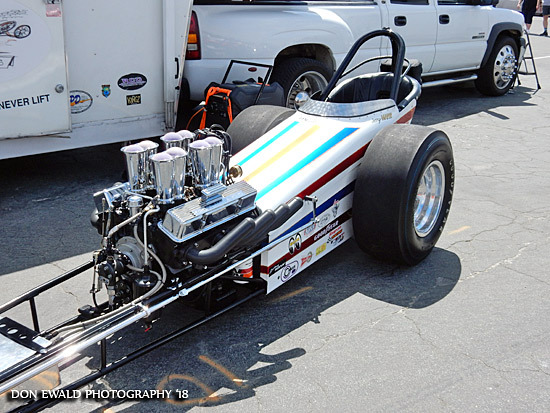 Along with Larry Brown, an ex-Top Fuel and Funny Car racer of name, they brought this beauty out from Oklahoma and trust me, they have a blast. 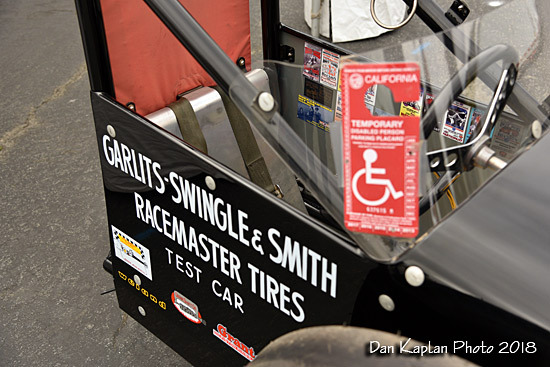 Oh, yea, he was also the first to commit to this year and already, 2019. 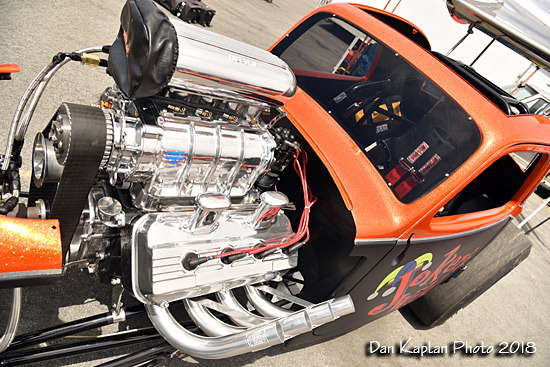 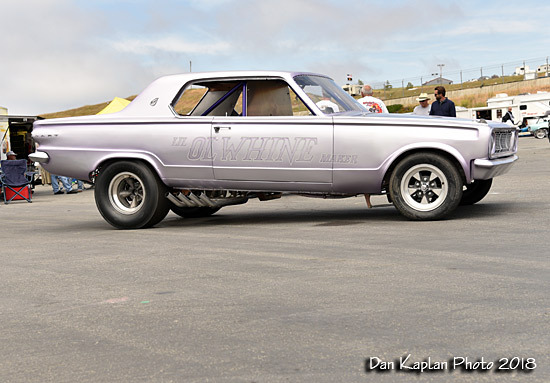 This is without a doubt one of the most spot on re-creatons of any funny car in the country, including a period correct Keith Black aluminum hemi. 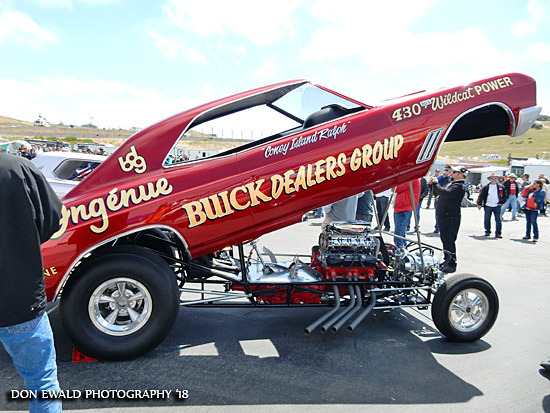 Ingenue Buick Dealers AA/FC restored and owned by John Lipori. 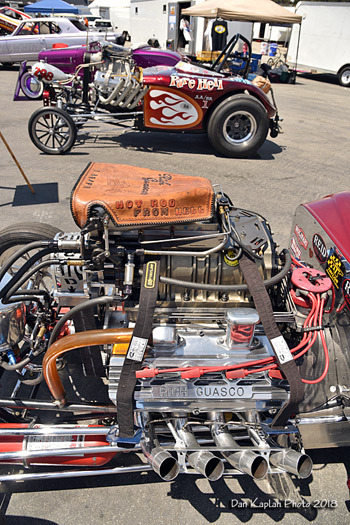 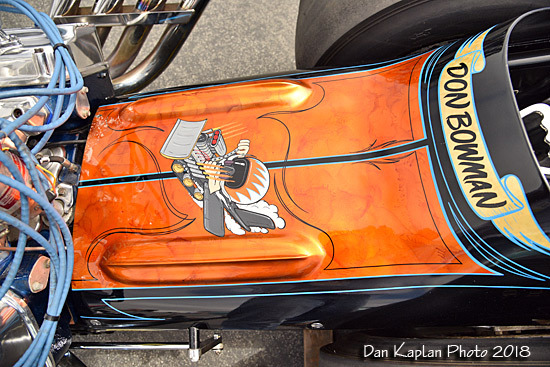 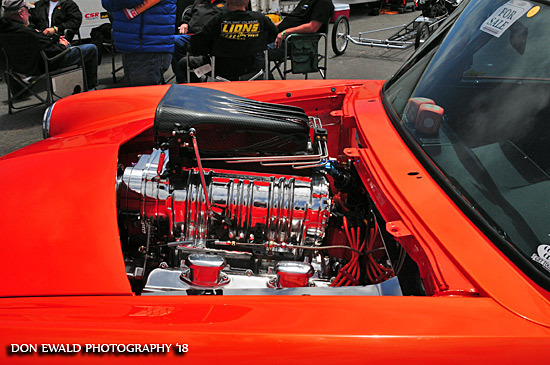 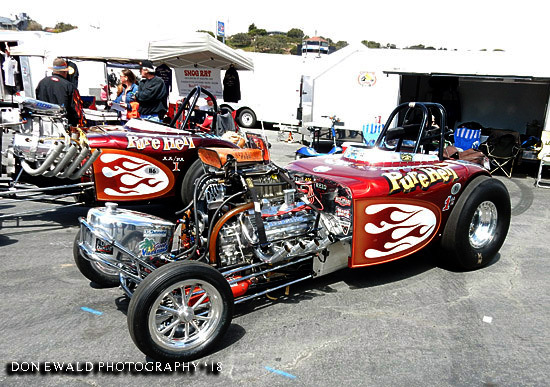 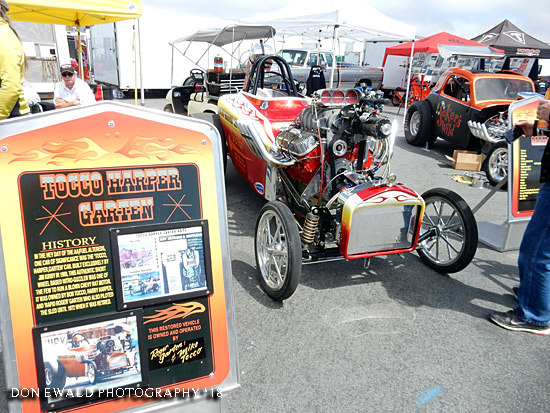 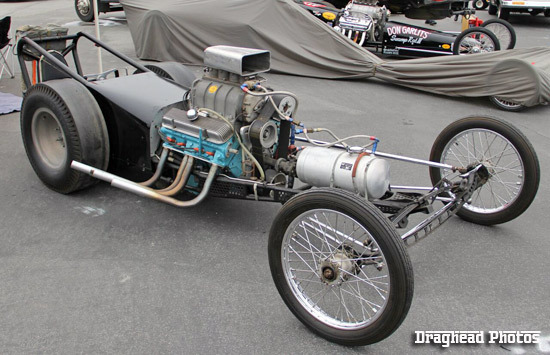 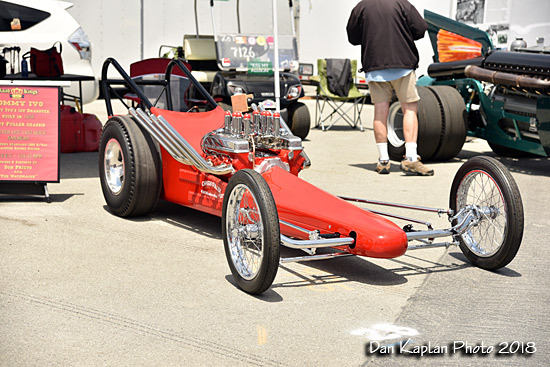 The all star dragster line-up was loaded with A+ restorations. 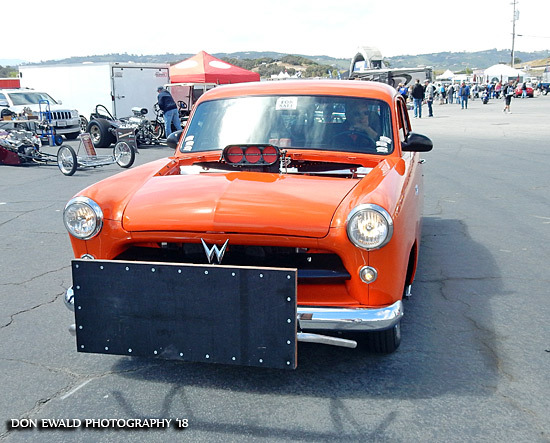 "Wild Thing" the lone flathead but damn, its a nice one. 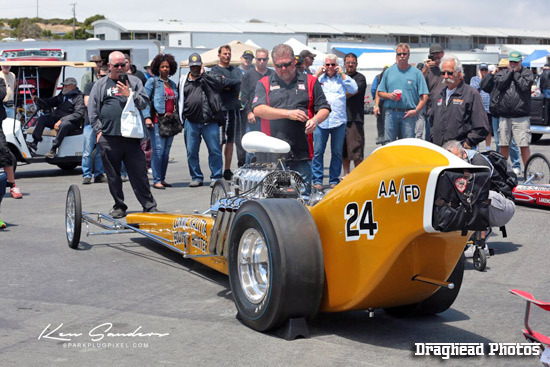 Jill Guasco comfirmed that the Nitro Revival fans were treated to history. 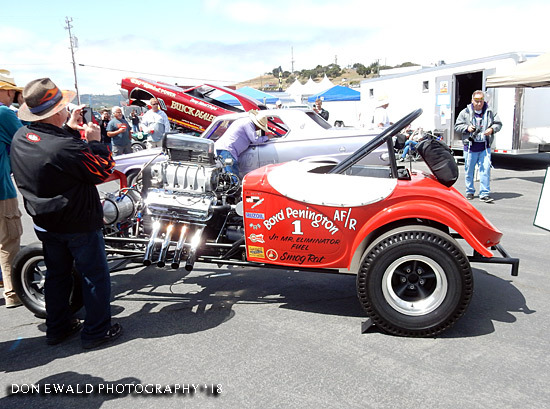 "Yes, we own both. 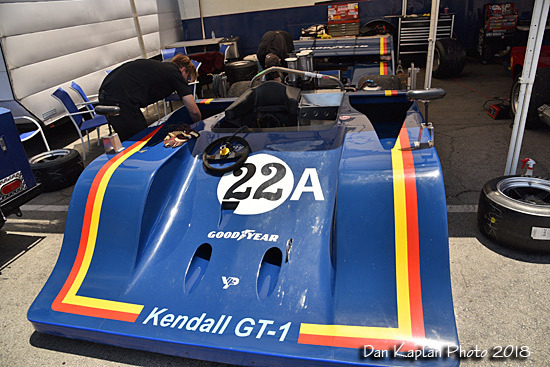 The other one has always been in a museum or on loan. 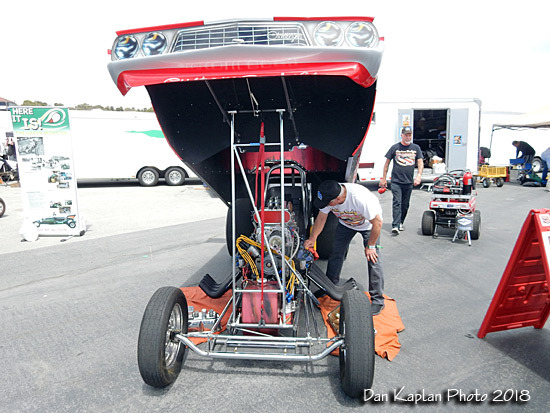 That was the first time the altereds have been side to side." 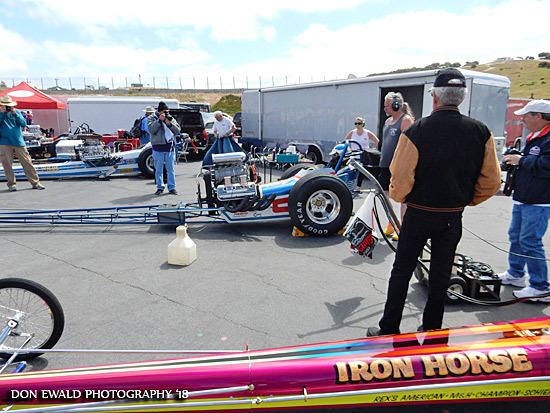 Steve Gibbs held his mandatory drivers meeting spelling out who would push start and how the Line of Fire would play out. 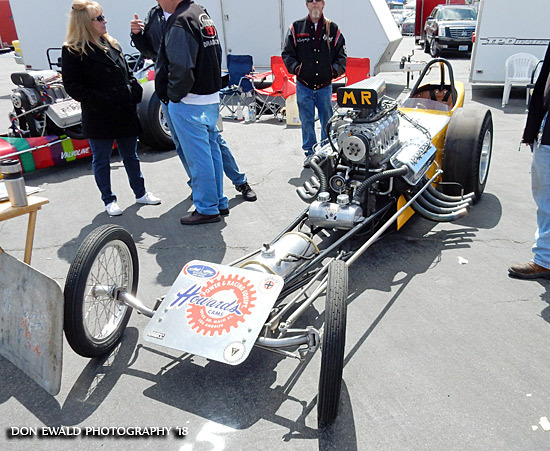 One of the three very diverse funny cars on hand was the rear engine Lil Ol Whine Maker AA/FC raced by Eddie Pauling and restored by Ed Philipp from Arizona. 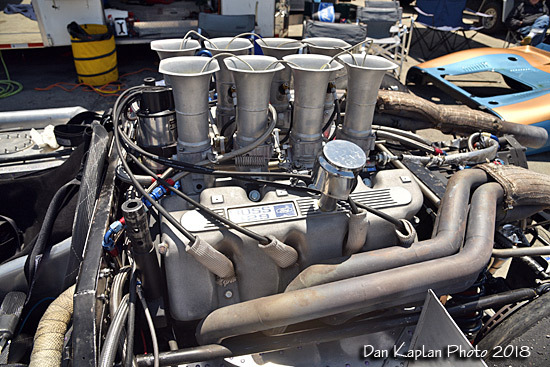 Friday was pretty much closed out by the roar of the huge Allison engine in the Green Monster A/D owned by Jon Rowley (Arizona). 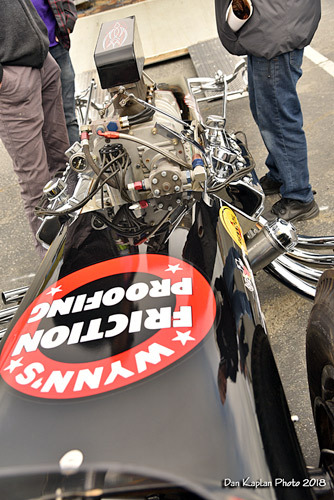 As the road course racers did for us, many of the nitro crowd visited their vintage neighbors just around the corner. 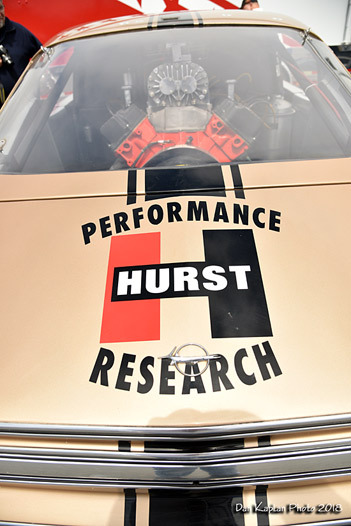 There was a wide variety of really cool race cars that left us asking the same questions they asked us. 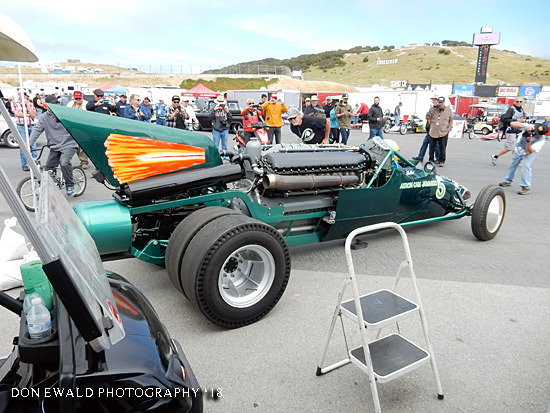 Like we said, when two vintage race car worlds collide.